Lent starts next week. C is looking forward to receiving the ashes and has informed me that he doesn't remember getting ashes last year. I know that if we had gone, he would remember! I don't remember why we missed mass last year, but I do remember that Lent was a tough go for me personally last year. I expect this year to be much better! One thing I plan to do this Lenten season is write thank you letters to all those in my life who deserve one! 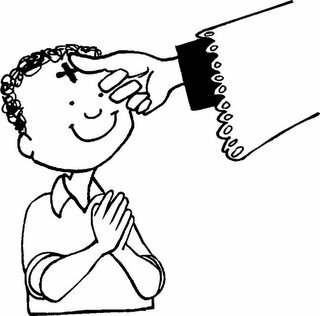 To the priest at our parish, who always makes the effort to be sure the boys are given a blessing -- even when they try to squirm away! To the restaurant we visit where we always feel welcomed. To whoever crosses our paths this season and deserves a thank you - I plan to stop just thinking I "should" write a letter, but actually do it. I plan to give up chocolate. Considering I tend to have something chocolate . . . oh, every day!! . . . that will be a noticeable sacrifice in my life. I toyed with giving up soda (which is what C has chosen - which I find funny, because the boys really don't drink much anyway - but B gave up Coca-Cola last year, and I think that's what is behind his choice) but it wouldn't be that hard for me to stop drinking soda for 6 weeks. B hasn't decided what he will give up this year. Oh, and another thing to add is to attend daily mass during the week (in addition to Sunday). I know I made this a goal at the beginning of the liturgical year, too, but I failed miserably. B has Mondays off, so I have no excuse not to attend on Mondays. I wish the mass was later than 8AM! I think if it was at 10, or noon, we'd be attending quite a bit during the week. But, considering that we have 8 masses on the weekend, I'm sure the priests aren't interested in adding any more masses.